This article is about the mathematical operation. For other uses, see Multiplication (disambiguation). Four bags with three marbles per bag gives twelve marbles (4 × 3 = 12). Multiplication can also be thought of as scaling. Here we see 2 being multiplied by 3 using scaling, giving 6 as a result. Animation for the multiplication 2 × 3 = 6. 4 × 5 = 20. 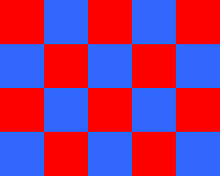 The large rectangle is composed of 20 squares, each having dimensions of 1 by 1. The multiplication of whole numbers may be thought as a repeated addition; that is, the multiplication of two numbers is equivalent to adding as many copies of one of them, the multiplicand, as the value of the other one, the multiplier. The multiplier can be written first and multiplicand second (though the custom can vary by culture); both can be called factors. Here 3 and 4 are the factors and 12 is the product. Thus the designation of multiplier and multiplicand does not affect the result of the multiplication. The multiplication of integers (including negative numbers), rational numbers (fractions) and real numbers is defined by a systematic generalization of this basic definition. Multiplication can also be visualized as counting objects arranged in a rectangle (for whole numbers) or as finding the area of a rectangle whose sides have given lengths. The area of a rectangle does not depend on which side is measured first, which illustrates the commutative property. The product of two measurements is a new type of measurement, for instance multiplying the lengths of the two sides of a rectangle gives its area, this is the subject of dimensional analysis. The inverse operation of multiplication is division. For example, since 4 multiplied by 3 equals 12, then 12 divided by 3 equals 4. Multiplication by 3, followed by division by 3, yields the original number (since the division of a number other than 0 by itself equals 1). Multiplication is also defined for other types of numbers, such as complex numbers, and more abstract constructs, like matrices. For some of these more abstract constructs, the order in which the operands are multiplied together matters. A listing of the many different kinds of products that are used in mathematics is given in the product (mathematics) page. The sign is encoded in Unicode at U+00D7 × MULTIPLICATION SIGN (HTML &#215; · &times;). The middle dot notation, encoded in Unicode as U+22C5 ⋅ DOT OPERATOR, is standard in the United States, the United Kingdom, and other countries where the period is used as a decimal point. When the dot operator character is not accessible, the interpunct (·) is used. In other countries that use a comma as a decimal mark, either the period or a middle dot is used for multiplication. In algebra, multiplication involving variables is often written as a juxtaposition (e.g., xy for x times y or 5x for five times x), also called implied multiplication. The notation can also be used for quantities that are surrounded by parentheses (e.g., 5(2) or (5)(2) for five times two). This implicit usage of multiplication can cause ambiguity when the concatenated variables happen to match the name of another variable, when a variable name in front of a parenthesis can be confused with a function name, or in the correct determination of the order of operations. In vector multiplication, there is a distinction between the cross and the dot symbols. The cross symbol generally denotes the taking a cross product of two vectors, yielding a vector as the result, while the dot denotes taking the dot product of two vectors, resulting in a scalar. In computer programming, the asterisk (as in 5*2) is still the most common notation. This is due to the fact that most computers historically were limited to small character sets (such as ASCII and EBCDIC) that lacked a multiplication sign (such as ⋅ or ×), while the asterisk appeared on every keyboard. This usage originated in the FORTRAN programming language. The numbers to be multiplied are generally called the "factors". The number to be multiplied is the "multiplicand", and the number by which it is multiplied is the "multiplier". Usually the multiplier is placed first and the multiplicand is placed second; however sometimes the first factor is the multiplicand and the second the multiplier. Also as the result of a multiplication does not depend on the order of the factors, the distinction between "multiplicand" and "multiplier" is useful only at a very elementary level and in some multiplication algorithms, such as the long multiplication. Therefore, in some sources, the term "multiplicand" is regarded as a synonym for "factor". In algebra, a number that is the multiplier of a variable or expression (e.g., the 3 in 3xy2) is called a coefficient. The result of a multiplication is called a product. A product of integers is a multiple of each factor. For example, 15 is the product of 3 and 5, and is both a multiple of 3 and a multiple of 5. 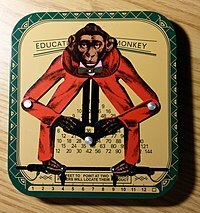 The Educated Monkey – a tin toy dated 1918, used as a multiplication “calculator”. For example: set the monkey’s feet to 4 and 9, and get the product – 36 – in its hands. The common methods for multiplying numbers using pencil and paper require a multiplication table of memorized or consulted products of small numbers (typically any two numbers from 0 to 9), however one method, the peasant multiplication algorithm, does not. Multiplying numbers to more than a couple of decimal places by hand is tedious and error prone. Common logarithms were invented to simplify such calculations, since adding logarithms is equivalent to multiplying. The slide rule allowed numbers to be quickly multiplied to about three places of accuracy. Beginning in the early 20th century, mechanical calculators, such as the Marchant, automated multiplication of up to 10 digit numbers. Modern electronic computers and calculators have greatly reduced the need for multiplication by hand. The Ishango bone, dated to about 18,000 to 20,000 BC, hints at a knowledge of multiplication in the Upper Paleolithic era in Central Africa. 13 × 21 = (1 + 4 + 8) × 21 = (1 × 21) + (4 × 21) + (8 × 21) = 21 + 84 + 168 = 273. The Babylonians used a sexagesimal positional number system, analogous to the modern day decimal system. Thus, Babylonian multiplication was very similar to modern decimal multiplication. Because of the relative difficulty of remembering 60 × 60 different products, Babylonian mathematicians employed multiplication tables. These tables consisted of a list of the first twenty multiples of a certain principal number n: n, 2n, ..., 20n; followed by the multiples of 10n: 30n 40n, and 50n. Then to compute any sexagesimal product, say 53n, one only needed to add 50n and 3n computed from the table. In the mathematical text Zhoubi Suanjing, dated prior to 300 BC, and the Nine Chapters on the Mathematical Art, multiplication calculations were written out in words, although the early Chinese mathematicians employed Rod calculus involving place value addition, subtraction, multiplication and division. Chinese were already using a decimal multiplication table since the Warring States period. Product of 45 and 256. Note the order of the numerals in 45 is reversed down the left column. The carry step of the multiplication can be performed at the final stage of the calculation (in bold), returning the final product of 45 × 256 = 11520. This is a variant of Lattice multiplication. The Indians are the inventors not only of the positional decimal system itself, but of most of the processes involved in elementary reckoning with the system. Addition and subtraction they performed quite as they are performed nowadays; multiplication they effected in many ways, ours among them, but division they did cumbrously. These place value decimal arithmetic algorithms were introduced to Arab countries by Al Khwarizmi in the early 9th century, and popularized in the Western world by Fibonacci in the 13th century. and then add the entries. The classical method of multiplying two n-digit numbers requires n2 digit multiplications. Multiplication algorithms have been designed that reduce the computation time considerably when multiplying large numbers. Methods based on the discrete Fourier transform reduce the computational complexity to O(n log n log log n). Recently, the factor log log n has been replaced by a function that increases much slower although it is still not constant (as it can be hoped). [4 bags] × [3 marbles per bag] = 12 marbles. When two measurements are multiplied together the product is of a type depending on the types of the measurements. The general theory is given by dimensional analysis. This analysis is routinely applied in physics but has also found applications in finance. 50 kilometers per hour × 3 hours = 150 kilometers. In this case, the hour units cancel out and we are left with only kilometer units. where m and n are integers or expressions that evaluate to integers. In case m = n, the value of the product is the same as that of the single factor xm. If m > n, the product is the empty product, with the value 1. Multiplication of numbers 0–10. Line labels = multiplicand. X axis = multiplier. Y axis = product. Extension of this pattern into other quadrants gives the reason why a negative number times a negative number yields a positive number. Note also how multiplication by zero causes a reduction in dimensionality, as does multiplication by a singular matrix where the determinant is 0. In this process, information is lost and cannot be regained. −1 times any number is equal to the additive inverse of that number. –1 times –1 is 1. For a > 0, if b > c then ab > ac. For a < 0, if b > c then ab < ac. The complex numbers do not have an ordering. Other mathematical systems that include a multiplication operation may not have all these properties. For example, multiplication is not, in general, commutative for matrices and quaternions. Multiplication is extended in a similar way to rational numbers and then to real numbers. The product of non-negative integers can be defined with set theory using cardinal numbers or the Peano axioms. See below how to extend this to multiplying arbitrary integers, and then arbitrary rational numbers. The product of real numbers is defined in terms of products of rational numbers, see construction of the real numbers. There are many sets that, under the operation of multiplication, satisfy the axioms that define group structure. These axioms are closure, associativity, and the inclusion of an identity element and inverses. A simple example is the set of non-zero rational numbers. Here we have identity 1, as opposed to groups under addition where the identity is typically 0. Note that with the rationals, we must exclude zero because, under multiplication, it does not have an inverse: there is no rational number that can be multiplied by zero to result in 1. In this example we have an abelian group, but that is not always the case. To see this, look at the set of invertible square matrices of a given dimension, over a given field. Now it is straightforward to verify closure, associativity, and inclusion of identity (the identity matrix) and inverses. However, matrix multiplication is not commutative, therefore this group is nonabelian. Another fact of note is that the integers under multiplication is not a group, even if we exclude zero. This is easily seen by the nonexistence of an inverse for all elements other than 1 and −1. Numbers can count (3 apples), order (the 3rd apple), or measure (3.5 feet high); as the history of mathematics has progressed from counting on our fingers to modelling quantum mechanics, multiplication has been generalized to more complicated and abstract types of numbers, and to things that are not numbers (such as matrices) or do not look much like numbers (such as quaternions). The same sign rules apply to rational and real numbers. wide, and is the same as the number of things in an array when the rational numbers happen to be whole numbers. Real numbers and their products can be defined in terms of sequences of rational numbers. indicates that n copies of the base a are to be multiplied together. This notation can be used whenever multiplication is known to be power associative. ^ "小学校の掛け算の授業では、順序に意味があるらしい。" [In elementary school multiplication lessons, the order would appear to be meaningful] (in Japanese). September 30, 2009. Retrieved May 14, 2017. ^ Announcing the TI Programmable 88! (PDF). Texas Instruments. 1982. Archived (PDF) from the original on 2017-08-03. Retrieved 2017-08-03. ^ Crewton Ramone. "Multiplicand and Multiplier". Crewton Ramone's House of Math. Retrieved 10 November 2015. .
^ Chester Litvin (2012). Advance Brain Stimulation by Psychoconduction. pp. 2–3, 5–6. ISBN 978-1-4669-0152-0 – via Google Book Search. ^ Jane Qiu (7 January 2014). "Ancient times table hidden in Chinese bamboo strips". Nature. doi:10.1038/nature.2014.14482. Retrieved 22 January 2014. ^ Fine, Henry B. (1907). The Number System of Algebra – Treated Theoretically and Historically (PDF) (2nd ed.). p. 90. ^ Harvey, David; van der Hoeven, Joris; Lecerf, Grégoire (2016). "Even faster integer multiplication". Journal of Complexity. 36: 1–30. arXiv:1407.3360. doi:10.1016/j.jco.2016.03.001. ISSN 0885-064X.